As I mentioned on the podcast a while back, I recently spent some time in the hospital. Without getting into all that again, I will say that the one benefit of the experience was that I lost a great deal of weight very quickly — so much so that I needed to go out and buy new clothes because a lot of my old stuff was suddenly way too big. (My wife, Erin, particularly enjoyed this part, and she picked out about 90 percent of my new wardrobe.) And, being the nerd that I am, I added a few geek shirts in my new, smaller size. I was surprised, then, a few days ago, when I saw that one of the shirts I’d purchased has become a point of contention over at Bleeding Cool. 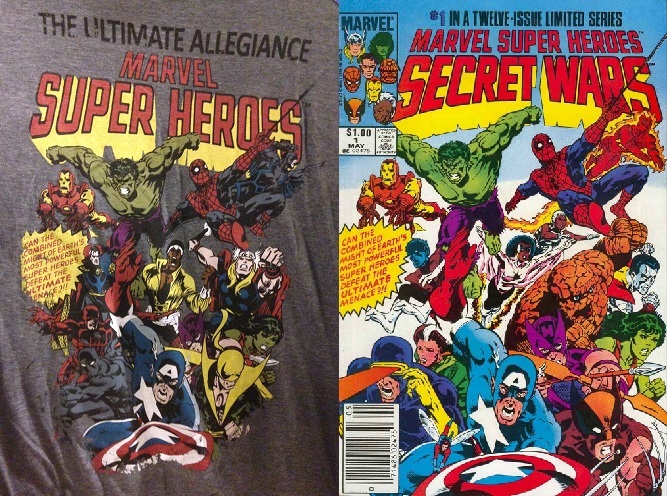 It concerned a shirt featuring the cover art from the original Marvel Super Heroes Secret Wars #1 (yeah, that was the full title of the original series). 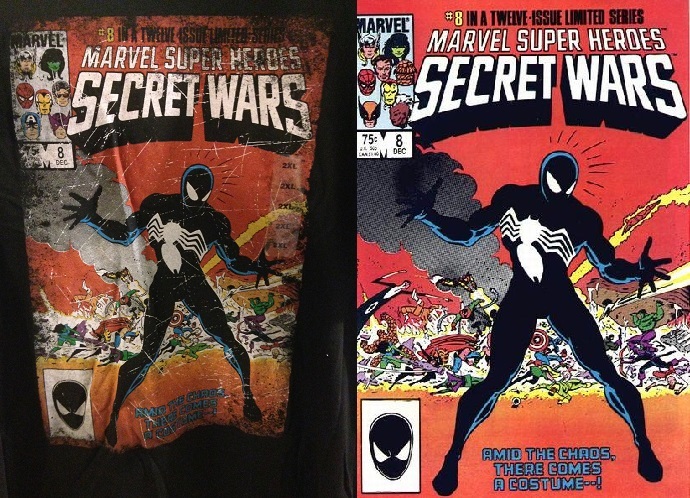 It was part of a large purchase of shirts and pants, and I didn’t really look that closely at it until I saw the Bleeding Cool piece… then the issue with the shirt became clear. Left: The Shirt. Right: The Comic. But this seems a bit too far, I thought. This isn’t simply a case of not including the X-Men in their newest action figure line. This is a case of actively stripping the characters from the past and replacing them, notably, with characters that are currently in various stages of production from Marvel Studios: Daredevil, Luke Cage, Iron Fist, Black Panther, the Inhumans, Dr. Strange… all characters who, it should be mentioned, didn’t have squat to do with the original Secret Wars. They also cut out Captain Marvel II, Monica Rambeau, which makes no sense, unless they’re afraid that fans will somehow confuse this character (who isn’t even identified by name in the original artwork) with the current Captain Marvel, Carol Danvers, currently in film pre-production. Most baffling of all however, was stripping the Wasp from the original image, but failing to remove her shadow from Captain America’s shield. Janet Van Dyne may not be appearing in the upcoming Ant-Man movie, but Evangeline Lily’s character seems poised to be a replacement of sorts. All of this, it should be noted, not only strips the artwork of the characters not currently under the Marvel Studios banner, but it also removes four of the five women from the original artwork and replaces them with… well, zero. Marvel’s been under enough scrutiny lately for the way they’ve cut the Black Widow out of the Avengers: Age of Ultron merchandise, and its parent company Disney hasn’t been doing much better with their Star Wars line. I wondered, initially, why they wouldn’t at least put an 80s-era Black Widow picture on the new artwork, if they were going to alter it anyway, but I suppose I’ve answered my own question. Left: The Shirt Part II. Right: The Comic Part II: The Sequel. This one isn’t as immediately obvious, because the changes are smaller, but look in the lower left-hand corner. Mr. Fantastic and the Thing are no longer behind She-Hulk, resulting in a nicely comical Bulldozer hurtling through the air after having been hit by nothing. On the right we’ve still got a gout of flame, but the Human Torch is no longer inside it. And in the upper left-hand box with the character faces Marvel used to have on every cover (side note: am I the only one who misses that part of the trade dress? I wish they’d bring it back) Wolverine, Storm and the Thing have been replaced by Captain America, Hawkeye and Wonder Man (another character who had nothing to do with Secret Wars and, to the best of my knowledge, isn’t in movie talks at the moment), while Reed Richards has tellingly turned into a gaping hole that evaporates into nothingness. From a purely business standpoint, I kind of understand what Marvel’s agenda is here. It doesn’t make a lot of sense to support a property that you can’t benefit from, so why go to the effort? But that’s in the case of new merchandise. This is a case where they’re taking pre-existing artwork and releasing it in a new form. In this instance it takes more effort to actively strip the characters from the artwork than it would to simply release it as-is. And although they won’t ever actually say such a thing it feels more and more like Marvel — at least as far as their merchandise department goes — is behaving like that kid who wants to take his ball and go home, spoiling the game for everybody else. This entry was posted in Geek Punditry and tagged 20th Century Fox, Fantastic Four, Marvel Comics, Marvel Studios, Merchandise, Secret Wars, X-Men. Bookmark the permalink. What an damned insult to the creators of these original stories these covers portray. This reminds me of George Lucas meddling with the original trilogy because he owns the license but fails to acknowledge he didn’t make them alone. Childish, immature BS. Is there a clause in the contract that states FOX gets profit from marketing outside the movie as well? If that’s so, Marvel were even bigger idiots then I gave them credit for when they sold off the rights for a pittance.